Originally based in Panama, this 35m steel vessel will become part of the Master Liveaboards fleet in 2018 as the M/V Bahamas Master. With 8 well-designed cabins that have panoramic windows, Bahamas Master can comfortably welcome 16 divers aboard. 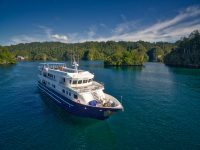 Explore Ambon, Banda, Forgotten Islands, Komodo and Raja Ampat, aboard the spacious Blue Manta Explorer. It is fully equipped to take you to some of the most beautiful, exotic and remote diving destinations in Indonesia. The M/V Carpe Novo Explorer, began service in March 2016! This new modern vessel, sister ship of Carpe Vita Explorer and Carpe Diem, is the newest member of the Explorer Ventures Fleet expanding our itinerary offerings to include longer trips to more remote areas in the Maldives. The elegant & spacious 16-passenger M/V Majestic Explorer Galapagos Liveaboard provides 8 air-conditioned rooms located on the main and lower decks. All rooms have private bathrooms and ocean views. Six of the eight cabins have twin beds and all cabins can be converted to queen beds for couples.